The MediaExplorer package includes six DVD Video disks that play in a regular DVD player, however there is a lot more to the disks than just video. By inserting a MediaExplorer DVD disk into a personal computer you can access the MediaExplorer DVD-ROM content. The DVD-ROM application contains a multimedia guide to free-to-air satellite radio and television stations that can be received in Australia and New Zealand. MediaExplorer's DVD-ROM includes over fourteen hours of satellite radio from hundreds of broadcasters around the world. Sample rush hour traffic reports and news from Manila, or tune into the latest Bollywood hits from Mumbai. 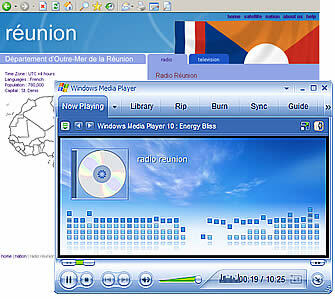 The radio samples can be simply heard by selecting the radio station's audio link from within the DVD-ROM radio panel. MediaExplorer's DVD-ROM also guides you to hundreds of world television channels. Catch the latest market news direct from Wall Street, or relax under a palm tree while watching an island group from Papeete. MediaExplorer is the most comprehensive guide to broadcasters providing free-to-air satellite signals that can be received in Australia and New Zealand. It's easy to find the particular station you are looking for in the MediaExplorer DVD-ROM, or perhaps you may prefer to "surf" MediaExplorer and find a station that captures your interest and imagination. Broadcasters are indexed graphically by satellite as well as by their studio location. With MediaExplorer's intuitive point and click navigation you will quickly find what you are looking for. Perhaps you are unsure exactly where in the world the islands of Wallis and Futuna are located? With MediaExplorer that's not a problem. The world map will quickly help you to locate featured nations and then guide you to radio and television channels available. MediaExplorer's DVD-ROM presents tuning details and sample content from broadcasters that can be reliably received on backyard dishes in Australia and New Zealand. The MediaExplorer navigation system guides you to large international broadcasters such as BBC World television, as well as to small exotic local broadcasters such as radio stations in Omdurman, the capital city of Sudan. After navigating to a particular nation or station you can easily access a menu of other radio and television broadcasters from the same country. The MediaExplorer national maps indicate the location of each selected station. Country names are presented both in English and local language spelling. To further enhance the feeling of "being there", national statistics and information are also displayed. Information including the population, capital city, principal languages spoken and time zone of each nation is presented. Background information about the selected broadcaster, their intended audience, typical programing and station history is available within the radio and television content tabs. MediaExplorer also includes broadcaster addresses, web site links and phone numbers allowing you to easily contact the station. As well as providing written information backgrounding hundreds of broadcasters, the MediaExplorer DVD-ROM also presents a multimedia resource of station programing. Each radio station profile includes a high quality stereo audio sample. The radio clips have been digitally edited to ensure that they faithfully represent the same audio quality that is received directly from the broadcaster. By listening to the audio clips you can instantly learn the program format of the station as well as being able to hear station identification announcements and jingles. Over 14 hours of audio from 180 radio broadcasters is contained within the DVD-ROM. As well as the tuning information provided to assist you in receiving the station live via satellite, web links to each broadcaster's homepage allow many stations to be enjoyed live via the Internet in a pop-up browser window. Television station tuning information is also presented allowing you to receive the channel direct via satellite. The DVD-ROM television profiles complement the sample television video which is viewed by inserting the MediaExplorer disks into a DVD player.